The Article: Cut Corporate America’s Free Lunch, Not Food Stamps by Terrance Heath in The Contributor. The Text: If Congress is serious about “fiscal responsibility,” they should cut corporate America’s “free lunch,” instead of voting for even more painful cuts to food stamps. It would bring in more revenue than any pseudo-savings from cutting food stamps. Millions of Americans were pushed over the “hunger cliff” by $5 billion in automatic cuts to food stamps, when the increased funding approved by Congress in 2009 expired on November 1st. The increase was Congress’ response to rising numbers of Americans relying on food stamps as a result of the recession — from 26 million in 2007 to 47 million in 2012. The increased meant to expire once the need subsided. The need hasn’t subsided. Thanks to an economic recovery in which 95 percent of the benefits have gone to the wealthiest one percent, the number of Americans who rely on food stamps has held at about 47 million. Meanwhile, Congress is still negotiating over the farm bill. The House version cuts $40 billion from food stamps over a ten-year period. The Senate version cuts only a tenth of that amount. The food stamp program will probably endure cuts. Republicans are reportedly optimistic about the progress on final bill. “Progress” will probably result in a final bill that cuts far less than the $40 billion in the House version, but far more than the $4 billion in the Senate bill. There’s another option that no one in Congress is talking about. In his New York Times column, Nicholas Kristoff, suggests that Congress eliminate what amounts to a “free lunch” for corporate America. Let’s remember that the government already subsidizes lots of food. When wealthy executives dine at fancy French restaurants, part of the bill is likely to be deducted from taxes, which amounts to a subsidy from taxpayers. How is it that food subsidies to anemic children are more controversial than food subsidies to executives enjoying coq au vin? Kristoff is referring to the tax exemption for business entertainment expenses, which allows corporations to deduct 50 percent of business costs related meals and entertainment from their annual taxes. Naturally, there are enough loopholes for corporations that know how to exploit them to deduct 100 percent of their “business-related” food, drink, and entertainment expenses. It amounts to a “free lunch” for corporate America, with the 99 percent picking up the tab. Kristoff doesn’t offer any estimates on the size of that tab. That’s because exact figures on how much corporate America’s “free lunch” is costing the rest of us are very hard to come by. My search for such numbers led me to a 2009 proposal to eliminate the Business Entertainment Expenses deduction, written by Duke University professor Richard Schmalback, and Rutgers University professor Jay A. Soled. Schmalback and Soled cite a 1979 Library of Congress report which said the government could raise $1.2 billion in annual revenue by eliminating the tax deduction for business meals and entertainment. That’s $1.2 billion in 1979 dollars. According to the Federal Reserve’s U.S. inflation calculator — is roughly $3.86 billion today. Simply eliminating the business meals and entertainment deduction could raise nearly as much revenue as the Senate farm bill cuts from food stamps. Generating nearly $4 billion in revenue, and eliminating the need to cut food stamps by the same amount, is reason enough to ask corporate America to pick up its own lunch tab. Conservatives claim food stamp cuts are about saving money, but the cuts come with considerable costs — both human and economic. Kristoff points out that almost two-thirds of food stamp recipients are children, disabled, or elderly. Malnutrition is a real problem, as mounting evidence shows that the effects poverty and malnutrition leave children less equipped to succeed in school and live productive lives as adults. Kristoff also cites a National Bureau of Economic Research study which shows that those who began receiving food stamps as children had better health as adults. Women, in particular, who had benefited from good stamps as children were more likely to go father in school, earn more money, and stay off welfare. When low-income families get food stamps, children’s health and nutrition improve. Children’s intake of iron, zinc, niacin, thiamine, and vitamin A increase. Contrary to recent reports, food stamps do not contribute to obesity. Poverty contributes to obesity, because it limits choices. People who are “food insecure” often have limited access to grocery stores that sell fresh fruits and vegetables, or lack resources necessary to keep and prepare fresh foods, leading them to rely on accessible, cheap, processed, foods — that are high in fat, salt and calories, but low in nutrition. Food stamp programs help reduce children’s risk of obesity, hypertension, and diabetes as adults, by increasing access to healthier foods. Cuts to food stamps undermine progress in the fight against obesity, by taking funding away from programs that make healthier foods more accessible and affordable for low-income families. Food stamps also lift families out of poverty by covering most food expenses, and helping stretch meager wages to pay for housing and other necessities. According to the USDA, since the 2009 expansion food insecurity among food stamp recipients declined by 2.2 percent, while food spending rose 4.8 percent. Food stamps are among the best forms of economic stimulus. Food stamp spending generates local economic activity and support jobs. When counted as income (because most food stamp recipients also have jobs), food stamps lifted 4 million Americans out of poverty in 2012. According to the Dept. of Agriculture, every $5 in food stamps generates up to $9 in economic activity. Most of the immediate benefits of that economic activity goes to local economies. Every dollar of food assistance increases the quality of a family’s diet, improves health outcomes, an helps sustain local economies and jobs. Every dollar cut from food assistance programs takes a little bit of those gains with it. The economic costs of food stamp cuts ripple outward from the human costs. In a New York Times column on “The Insanity of Our Food Policy,” Joseph Stiglitz explains how House Republicans’ proposal to cut $40 billion from food stamps increases inequality. What’s more “widely unequal” than children skipping meals because of cuts to food stamps, while rich corporate executives get a “free lunch” taxpayers expense? What’s more “insane” than taking away school lunches while continuing to foot the bill for executive dinners? Congress should cut corporate America’s “free lunch,” not food stamps. 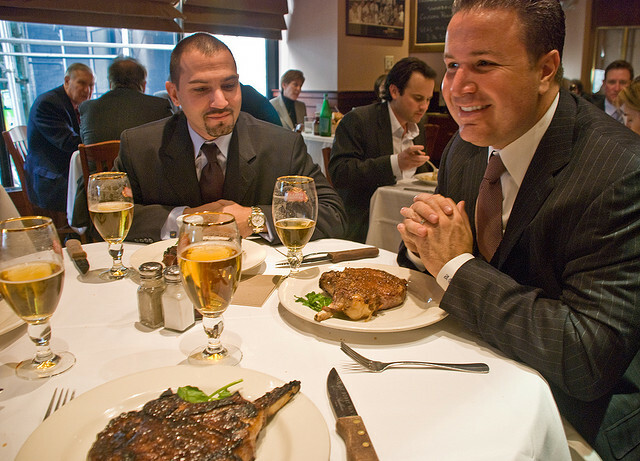 Wealthy corporate executives can afford to pay their own lunch tab. America can’t afford to become a country that feeds the rich and abandons the poor and hungry.